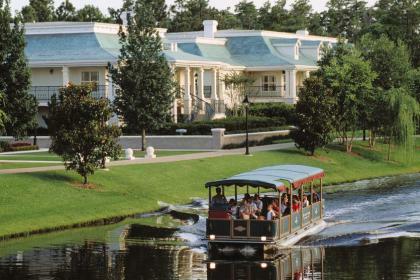 Disney’s Port Orleans Riverside Resort combines two distinct areas, Alligator Bayou and Magnolia Bend, both exhibit the distinct characteristics of the mighty Mississippi and the upriver adventuresome and elegance of the late 1800’s in the Deep South. 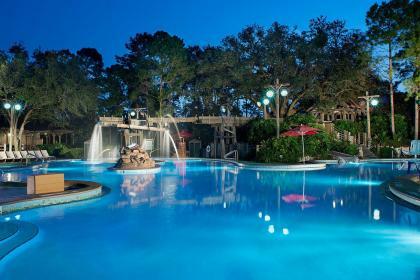 Experience Louisiana charm and good old-fashioned Southern hospitality at this wonderfully themed resort, inspired by Mark Twain and the gentle days of paddle steamers on the Mississippi. 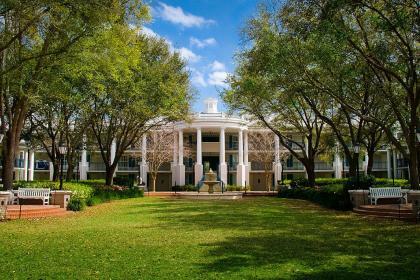 Comprising an antebellum-style mansion and bayou accommodations, this charming Southern-style resort hotel is set along the Sassagoula River and is just a stone’s throw from the Downtown Disney area and Epcot. 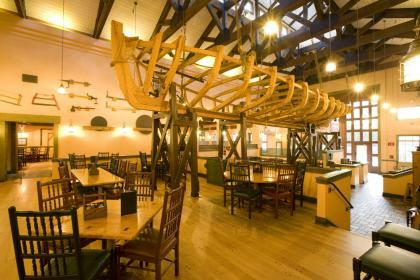 Enjoy Southern-style cuisine at Boatwrights, the resorts full-service restaurant which is modelled after a boat-making warehouse, or sip a late drink in the River Roost Lounge, an old farming exchange where southern gentleman would meet to discuss their deals on harvest wares. 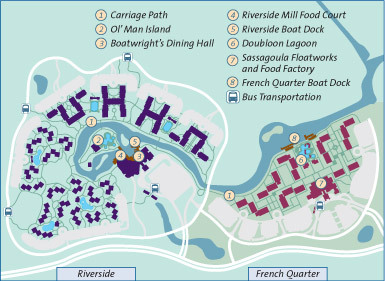 Take advantage of the unlimited complimentary transportation to the Walt Disney World Resort Theme Parks either via road or water. 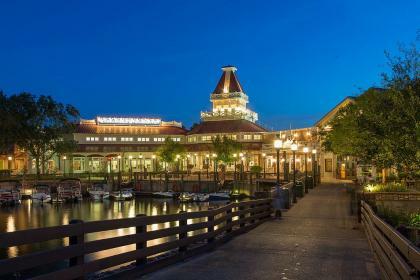 When away from the magical Walt Disney World Resort Theme Parks, take time to cycle around the resort, take a boat journey or better still relax on a horse-drawn carriage! 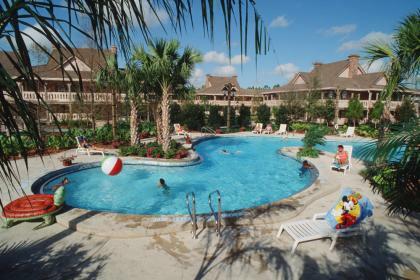 Along with its sister property, the Disney’s Port Orleans Resort French Quarter, these resorts offer great value for money for a fabulous Disney holiday, in the moderate range of the Disney Resort hotels. 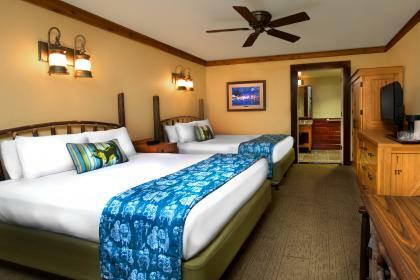 After a great day in the parks relax under the stars with a Disney movie. A Giant boat hangs overhead in this restored warehouse once used for building ships. 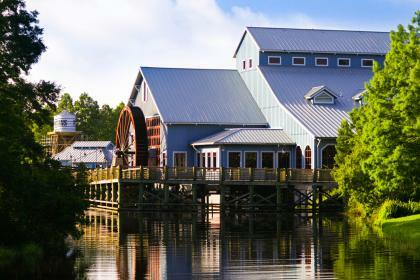 The casual restaurant overlooks the Sassagoula River and serves breakfast and dinner. 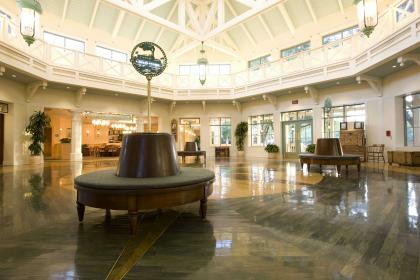 Menu items include hearty breakfasts, steaks, prime rib, seafood dishes, Southern specialties, and a full-service bar. A working cotton press operated by a water wheel acts as the centrepiece of this food court. Several different stands serve burgers, sandwiches, pasta, chicken dishes, salads, and more. There is also a country market loaded with pre-packaged items. Beer and wine are available. The food court is open from early morning to midnight and serves breakfast, lunch, and dinner. This night time-only lounge is outfitted with a bar and overstuffed chairs next to a fireplace. Snacks and refreshments are served. 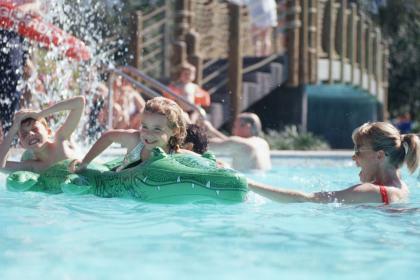 The Roost is open daily from late afternoon to midnight. 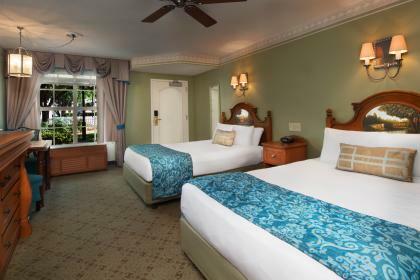 Fresh-baked pizza is available for room delivery from late afternoon to midnight every day. 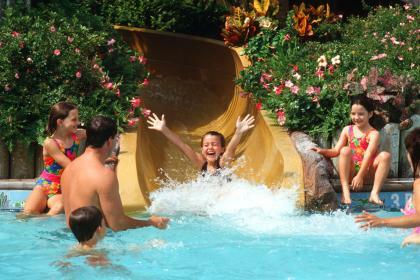 Open from late morning until dusk, this poolside bar offers, snacks, and refreshments.